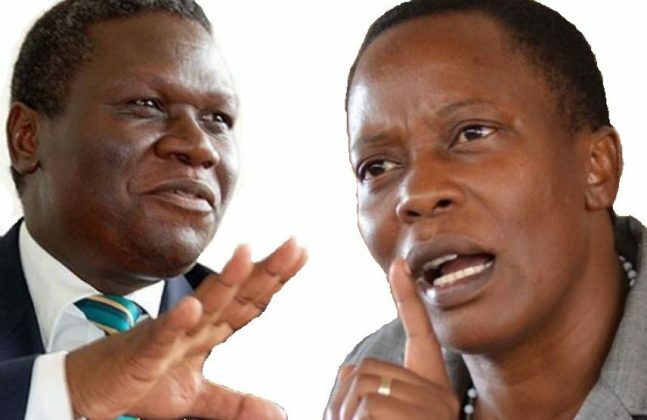 KAMPALA – Mukono Municipality MP Betty Nambooze has said Democratic Party president Norbert Mao has no moral authority to question her allegiance to the People’s Government formed by Dr Kizza Besigye. Despite being members of DP, Nambooze is one of the biggest supporters of the People’s Assembly while his other colleague, Kampala Lord Mayor Erias Lukwago, has been appointed as the deputy president. This has not pleased Mr Mao, who has labelled them watermelons. “We do not want watermelons in DP. Those who are only green outside but inside there are many colours; there is no room for watermelons in DP,” Mr Mao said. However, Ms Nambooze said the DP president should stop mending into the affairs of other opposition leaders. “These days Mao addresses the press at DP headquarters with two party leaders; Mr Abedi Bwanika of Peoples Development Party (PDP) and Mr Micheal Mabiike of Social Democratic Party (SDP), and we do not see any contradiction in that because we have already agreed as opposition in Uganda to work together in order to stop the dictatorship,” Ms Nambooze said on Tuesday. “Mr Mao knows why I am with [Dr] Besigye. Mao failed to contest as a presidential candidate in 2016 and instead choose to go and support GO Forward of former Prime minister Amama Mbabazi,” she added. “He is also working closely with Mr Robert Kyagulanyi, who is an independent, and we all appreciate that the situation we are working in, we have to work closely with others,” she added. While addressing a press conference on Monday, Mr Mao said belonging to DP is a choice and that they were thinking of taking action against those who are lukewarm. “I think we have to make decision and push them out because I think when you’re at the door, it means you’re not sure when to come in. Some of our members are now part of that People’s Government. That issue will be discussed in the national executive committee,” he said.